This project is quick, simple and fun, along with being a great way to use up scraps! What You Need: zip-close plastic sandwich bag (or larger, depending on the size of your butterfly), half a pipe cleaner, scissors and (here’s the fun part) all kinds of scraps from your “craft pantry”: dyed pasta, bits of yarn, tissue paper squares and paper “confetti” kids cut by themselves, bits of craft foam, sequins, glitter and so on! 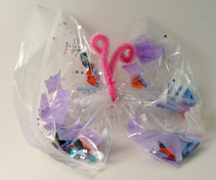 How You Make It: Set out a variety of supplies in small containers for preschoolers to choose what to add to their butterfly bag. This is so fun! Then, make sure most of the air is out of the bag, seal the bag and distribute the scraps somewhat evenly on either side of the bag as you “pinch” it together in the middle. Wrap pipe cleaner around middle of bag, twist to secure and bend ends for antennae. This entry was posted on Monday, July 23rd, 2007 at 5:00 am	and is filed under animal crafts, recycled crafts, spring crafts. You can follow any responses to this entry through the RSS 2.0 feed. Responses are currently closed, but you can trackback from your own site.